There was a time before I had children when I bought fancy expensive hand soap. After having three kids that just wasn't in the budget anymore. Thankfully after trying Dial soap I realized that you don't have to spend tons on money to get a great product. I was sent a sample of Dial Sugar Cane Husk Scrub to facilitate this review. In my house we need soap that smells good. I don't know what it is about my kids but they will not use soap that doesn't smell good. I'm pretty sure they get it from me. OK fine they definitely get it from me, I won't use soap that doesn't smell good either. My favorite part about the Dial Sugar Cane Husk Scrub is the scrubbing part. I'm using this soap in the kitchen and it's perfect for washing your hands after handling raw meat. I just feel like my hands are really getting clean, Like the sugar is doing a better job than plain soap alone. But don't worry, this soap will not try out your hands. It is very soothing and makes your hands fell soft. It's almost like exfoliating your hands like you would exfoliate your face. The smell is pretty good too since it smells like sugar. Who doesn't like the smell of sugar? I have two coupons to giveaway to two lucky readers so they can try the Dial Sugar Cane Husk Scrub for themselves. Enter on the Rafflecopter form to win, US residents only. Disclaimer - I received a sample of Dial soap as a member of Purex Insiders. No further compensation was provided and all opinions are mine. 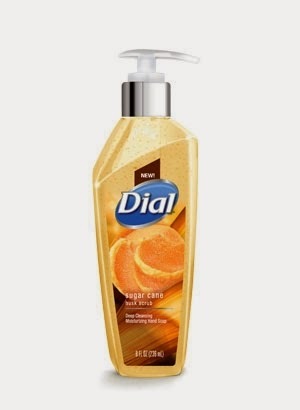 I love a nice smelling hand soap, and it's even better if it smells good! I'll have to look for this at the store!